It's time to serve our kids better! Remember when eating out was an occasional treat? Many of us went out for special occasions, such as birthdays, when there was something to be celebrated. These days, it’s a different reality. 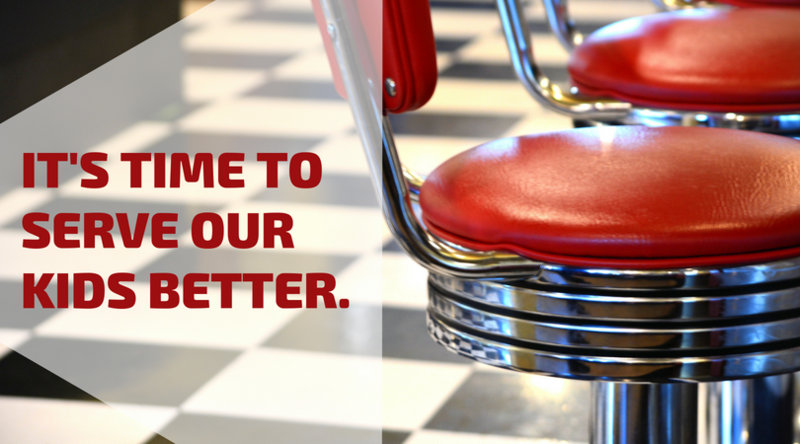 When life gets too busy, we often turn to restaurants to feed our families. While eating out is sometimes a necessity, it presents a real challenge to feeding your family healthfully. It is time to get restaurants to serve kids better. Kids consume about 25% of their calories from eating out. About 42% of children age two to nine eat fast food on any given day. Approximately 96% of entrees in US chain restaurants fail to meet basic USDA nutritional standards. A study of the top 50 US chains restaurants found that 86% of children’s meal combos are too high in calories, 55% are too high in saturated fat and 66% are too high in sodium. In fact, children eat almost twice as many calories when they eat a meal at a restaurant than they do at home. What do we want to see? Meals that will help our kids grow up healthy, served with a healthy drink, include a fruit or veggie, whole grains and lean protein, have less than 600 calories and are low in saturated fat, salt and sugar. And we know it’s possible. In fact, we see options popping up around the country. Now it is time for the big guys to do the right thing and give their customers what they want. Will you help? With an easy push of a button you can send an email to the CEOs of Burger King, Applebee’s and IHOP asking them to do the right thing and make all of their kids’ meals healthier today. We know it is possible. It’s good for all of us when we serve kids better.